How can local sports promote citizens’ health and which impact they could have on social growth? These and other topics will be discussed at the meeting: “Sport as a factor of social growth and well-being for citizens”, which will be held on Monday April 29, at 17:00 at the Grand Hotel Arenzano, in Genoa. The participants of the event will be Gian Francesco Lupattelli, President and Founder of ACES Europe and MSP Italia, Sonia Viale, President of health and wellness of MSP Italia and vice-president of Liguria region and Francesco Bruzzone, President of MSP National Council. In the discussion will also participate mayors, MPs, municipal and regional councillors, athletes, sport managers and citizens. 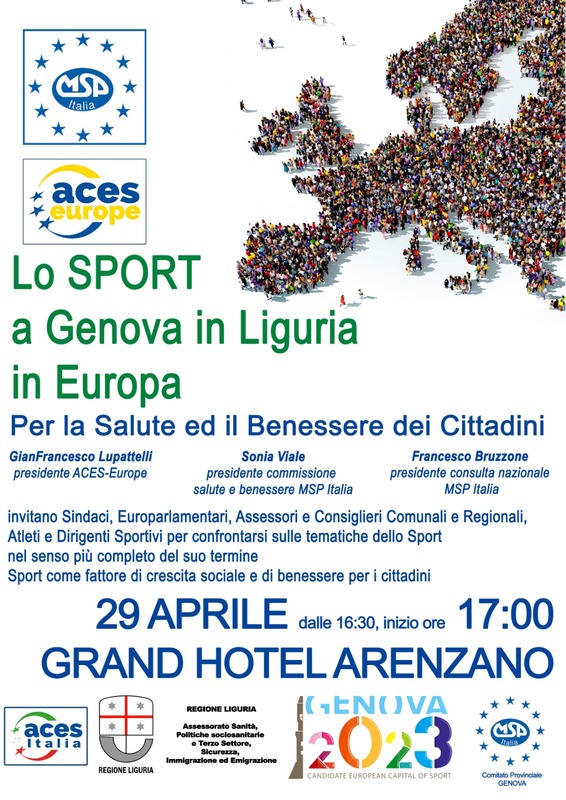 The event is promoted by ACES Europe, ACES Italia, MSP Italia, the city of Genoa and CONI.